Have you ever found yourself waking up in the wee hours of the night for no apparent reason? 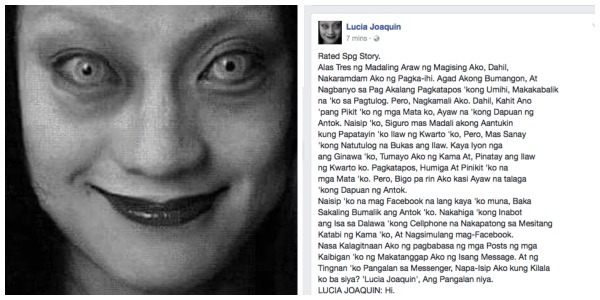 If you have been in such situation before, then the story of Lucia Joaquin will send the chills down your spine. The hair-raising story, which recently gained online fame after it circulated on social media, has sent netizens buzzing. In the story, a certain Enzo Cruz woke up at around 3 in the morning to take a pee. When he returned to bed, he found himself having difficulty going back to sleep. He then decided to turn off the light thinking that it could help him get his much needed slumber. However, this strategy didn’t seem to work. Soon, Enzo found himself using Facebook to get himself to fall asleep. But the unexpected turn of events would give him sleepless nights probably for the rest of his life. While using Facebook, Enzo suddenly encountered a certain Lucia Joaquin on Messenger. Initially, the conversation seemed usual. LUCIA JOAQUIN: Kuya, Pwede po 'bang Makipag-usap? mo. 'Nung Nakita nga kita, Nagkagusto Ako agad sa'yo eh. as well as her Facebook page. LUCIA JOAQUIN: Kakagawa 'ko lang po kasi ng Facebook 'ko eh. Next thing he knew, Lucia was already asking for a photo with him. Friends Dito sa Facebook 'ha?! Suddenly, Enzo found his other cellphone phone vibrating and flashing for no apparent reason. Towards the end of the conversation, Enzo asked Lucia for a clearer photo since he wanted her to guess how old she was. But to his surprise, Enzo got more than what he bargained for when he saw Lucia’s profile photo. ENZO CRUZ: Sige Tingnan 'ko sa Account mo.